The runaway critical and commercial success of Alison Bechdel s Fun Home has paved the way for the re-issue of Bread & Wine. 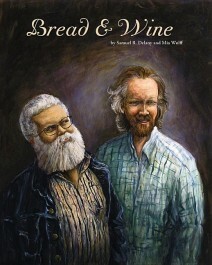 Written by black, gay science-fiction writer, professor, and theorist Samuel R. Delany, and drawn by artist/martial arts instructor Mia Wolff, Bread & Wine is a graphic autobiography that flashes back to the unlikely story of how Delany befriend ed Dennis, and how they became an enduring couple Delany, a professor at Philadelphia s Temple University, Dennis, an intelligent man living on the streets. For casual readers and fans, Bread & Wine is a moving, sexually charged love story, with visuals informed by Wolff s professional physical pursuits. Her black-and-white, pen-and-ink work not only expressionistically represents the characters body language and the bustling New York setting, but is also filled with impish art references and visual puns. The scholarly potential for the book, based on the poem Bread and Wine by the German lyric poet Friedrich Holderlin, not only encompasses queer, African-American, and graphic novel studies, but also exploration in the literary and paraliterary academic fields. This edition includes an introduction by Watchmen writer Alan Moore, commentary by the book s protagonists, Delany and Dennis, and a new interview with Delany and Wolff.